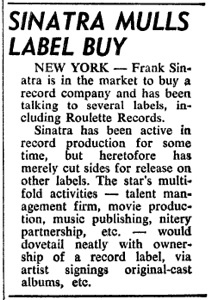 In the following several weeks, both Sinatra and MGM would make offers for Verve, with Norman Granz accepting the higher offer from MGM in mid-November. 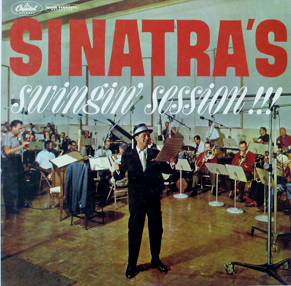 Considering the timeline, it’s hard to argue that Reprise was really in play during the Swingin’ sessions. I suspect that part of the legend of Frank being distracted because he knew that Reprise was awaiting him like a virgin bride may have come from the fact that by the time Swingin’ Session!!! was actually released about four months later, Reprise had come to fruition, but in the late summer of 1960, such was simply not the case. Having said that, it’s certainly possible that Frank pushed or rushed these sessions, but remember that at this point in time, he was a bankable commodity non plus ultra, with more cache than the rest of us losers put together, and the last thing he wanted at this point was to put out shoddy product. Frank was a professional, and he knew how to buckle down and get to work, and although he may have been biting both lips and anxiously tapping all ten toes, when the red light came on, he got to work and he delivered. At least that’s my take on things as they stood at this particular juncture in his professional and business careers.